Calvin, Hobbes, Everclear, and God. Part 3. This is the final post in a series about fatherhood and it’s deep imprint on the fabric of our society. You can read part one here and part two here. In this series we have seen the heart break and peril we find with the loss of fatherhood today. The statistics continue to overwhelm us and whatever notions we hold of “being progressive” and “modernizing” the family to where fathers are not included/needed looks empty and foolish. To think we can escape our need for strong fathers is to live in denial. We were created by the Ultimate Father and the need for fathers is written in our DNA. But what can we do in our all our different situations? How do we actually change? What can we do today…right now…to start turning the tide? My hope in the last post of this series is to offer some real encouragements and practical helps, no matter where you are. Perhaps your father left long ago or has passed away. Keep reading, studying, and praying about the Fatherhood of God. Constantly allow Scripture to remind you to the greatness and goodness of God the Father. Study His attributes. Memorize passages that tell of God’s character and nature. Hold fast to the truth that, in Christ, you have a Father who is never gone. God the Father is always with you in this life AND for eternity. Pray continually that God would sink this into your heart. Stay connected to your local church. As you build community and serve, God may bring a “spiritual father” or two into your life for a season. These would be older men of God who can encourage you and speak life to your heart. While they aren’t your earthly dad, God can use them mightily in your life. Perhaps your earthly dad has made huge mistakes. Maybe he has only caused you pain. Constantly allow Scripture to remind you of the greatness and goodness of God the Father. Study His attributes. Memorize passages that tell of God’s character and nature. Pray for your earthly dad. Find ways to bless him and honor him. As much as possible for you, be a peace-maker and reconciler with your dad. You aren’t responsible for the way he reacts but, by the power of the Holy Spirit, you can obey God’s command to honor your father (a command that has no timeline or qualifiers about the quality of our dads). Know this: his mistakes don’t have to carry over and define YOUR family. My own dad grew up with a horrific father who made many terrible and hurtful mistakes. I write a little about that here. I can testify that by the power of God’s grace, my dad has repeated NONE of those mistakes with my our family. He has been an amazing dad. In Christ, you can literally change the family tree. A new legacy can start with the family you build. Do not let this slip from your mind! Stay connected to your local church. God may have some “spiritual fathers” in store for you too. Perhaps you have a great earthly dad who loves God, his wife, and his children. Thank God daily for the rich blessing of a good dad. Thank your dad for what he has done. Write him a letter. Call him up. Fatherhood is not for the weak. It can be tough. Thank your dad if he has risen to the challenges. Perhaps you are still looking for the right man to marry and raise a family with. Hold fast to what will matter for the entirety of a marriage. Hint: it’s not what the rom-com’s tell you. Wait for a man who loves Jesus. Start there. Stay connected to your local church. In fact…if you have a guy you are interested in, sign up for nursery duty at your church and TAKE HIM with you. Will he go with you? How does he handle babies/toddlers/pre-schoolers? Does he expect you to change all the diapers? What are his interactions like with the little kids? This will not only be a good opportunity to serve your church, but a fantastic way to get a sense of where his heart may be. Remember that when you make decisions about marriage, you are making decisions that have far, far reaching consequences. Your prospective children and grandchildren, etc, etc, are all impacted by the mate you choose. Again, wait for a man who loves Jesus. Let me say this as well: wait for a man who loves Jesus. No, really…it matters. Perhaps you are still searching for the one who will be your wife and mother of your children. Stay connected to your local church. Watch strong, mature fathers in your church and how they father their children. Ask them questions. Seek wisdom! Take turns serving in the children’s or youth ministries in your church. Learn how to talk with kids (or rather, how to listen!). Pass on wisdom you may have for their season of life. Perhaps you and your wife have just been blessed with a child. Whatever you do, do not overlook these early years. The attitude of “I’ll invest in them when they get older” is not right. Be a great dad from the opening tipoff! Love and serve your wife well. She is most likely exhausted and questioning if she is doing well in her role. Encourage her and look for ways you can help. Pray for your kids now. Hold them often and pray for them. Pray for their future mates. LOVE YOUR WIFE. Treat her kindly and let your kids see that you truly cherish her. How you are with her will shape the views of your sons and daughters on marriage and their spouses. I don’t want to frighten you but I don’t want you to take this element lightly. LOVE YOUR WIFE. You stood before God and entered into a covenant with her and the Lord, right? Honor that covenant and LOVE YOUR WIFE. This matters. Well beyond your own lifetime, this will matter in the legacy you leave behind. Have I made this clear? LOVE YOUR WIFE. Spiritually lead your home. Be the first one up on Sunday mornings and help everyone get ready for church. Make it a day that feels different. Around our house, I crank up the music and we bake up our “Sunday Cinnamon Rolls” for breakfast. Whatever works. When they know that daddy is excited to go to church to learn about and praise Jesus, it makes a difference. Be the tone-setter. Don’t be lame and dragging behind. Be a dad and make Sundays a morning you really nail. Pray for your children. Pray with your children. Both. All the time. Lead family devotions. Read Scripture or Bible story books. Memorize Scripture with them. Ask them questions about the Bible. Let them see you have a passion for Jesus that goes beyond just Sunday morning. LOVE YOUR WIFE. Do it, do it. Made a mistake with your kids at some point? Welcome to the club. Go to them. Admit and apologize. Look them in the eye and tell them you love them. Involve them in missions. Praying for your neighbors or a non-Christian friend? Involve the kids. Integrate them into the ways you are trying to see more people come to know Jesus. Give appropriate and abundant affection. With my three little ones, I try to give them 3 different types of positive touch everyday. One type is my strength. This would be “wrestling with dad”, where we get on the ground and play “rough.” The second type is of positive touch is prayerful. Put your hand on their little heads as you pray over them. Let them hear and feel that you are praying over them. The third type is appropriate affection. Or…as my kids know them BEAR HUGS! Do not miss out on any opportunity to hug your children and let them know their father loves them! Keep being a good dad, no matter how old your kids are. You are still their dad. Oh and one last thing…..LOVE YOUR WIFE. My wife and I now have 3 children. I’d like to close by telling you one of my absolute favorite parts of being a dad to them. I freely admit; I make my share of fatherhood mistakes! In no way do I have it all figured out. But this one thing is one of my favorite…. What’s happened with each of their births is this: the day or two we spend in the hospital is filled with tests from the doctors and nurses (#ScissorKickANurse), visits with family and friends, and maybe a couple hours of sleep on a small fold-out bed. THEN, we get to my time. Everyone leaves, Jessica gets to shower, the room gets quiet and it’s just me with my new child. My time. “Hey Caleb/Seth/Kiley….this is your daddy! Welcome! We are so glad to have you here. Mommy and I are so, so, so happy that God has let us be your parents and watch over your life. We both love you so much. I want to tell you the truth. You see, this world you have entered is a fallen world. Sin is here. People will hurt you. I will mess up. You will too. This is a broken place because we are all sinners. We haven’t obeyed God. But! God is a Father and He loves you so much! God the Father has sent His own Son, Jesus, to this place. Jesus lived here and He never sinned! And Jesus has laid His life down so we don’t have to miss out on God’s love. God the Father lets us be in HIS family! Look, I know they aren’t comprehending the words…but I want them to hear the Gospel first from their daddy. I want them to hear it first from my voice. It certainly isn’t the only time I will tell them about our Father, but those moments in the quiet where I get to be the one to lay out the beauty of the Good news means a great deal to me. From the beginning of their life, I want them to hear from their daddy about what really matters. My title of “father” is a borrowed mantle. God invented it, He defines it, He IS the Perfect Father. But in His infinite grace, He allows me to share that title for these years I have on this earth. That never ceases to amaze me. The Father lets me be a father too. If you are a dad, then you are getting to borrow that title too. Use it well. Don’t bring dishonor on the office of fatherhood. Love your wife and point your family toward Jesus Christ. Tell them of the Gospel. Tell them of a Father and a Son and a plan to save this world. Below is a song from the band Citizens & Saints called “Father, You Are All We Need.” May it be a reminder to you of all that God the Father has done. May it be a song you can boldly declare from the deepest part of your heart. As always, thank you for reading. Your comments and insights are always welcomed. If you’ve enjoyed this series, share it with a friend. 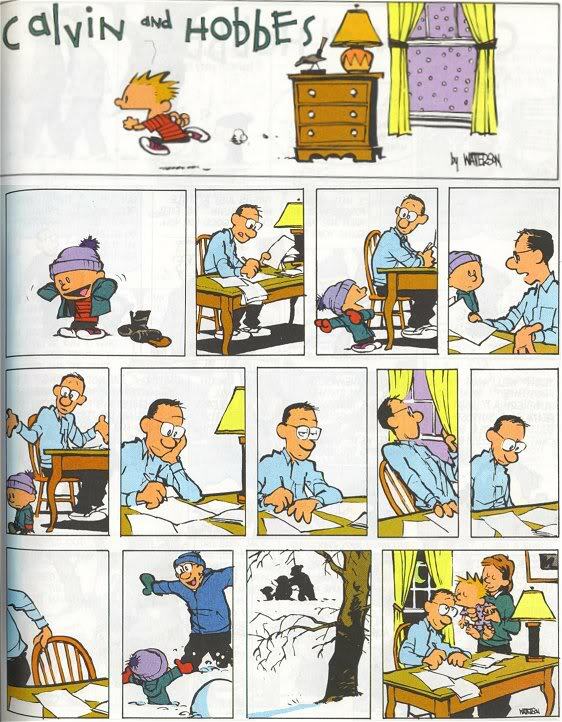 This entry was posted on October 22, 2014 by Josh Humbert in Blogroll and tagged 90's music, 90's pop music, calvin and hobbes, Christianity, Citizens And Saints, Dads, daughters, discipline, everclear, family, Fatherhood, fathers, forgiveness, growth, manhood, marriage, maturity, raising daughters, raising sons.